John Hoyland was born in Sheffield in Yorkshire and educated at Leighton Park School before going onto study at Sheffield School of Art, Psalter Lane, and the Royal Academy Schools. He was elected to the Royal Academy in 1991 and was appointed Professor of the Royal Academy Schools in 1999. The National Portrait Gallery holds portraits of the artist in its collection. His first solo exhibition was held at the Marlborough New London Gallery in 1964 and he had a solo show at the Whitechapel Art Gallery in 1967. In the 1960s Hoyland's work was characterised by simple shapes, high-key colour and a flat picture surface. In the 1970s his paintings became more textured. He exhibited at the Waddington Galleries, London throughout the 1970s and 1980s. During the 1960s and 1970s he showed his paintings in New York City with the Robert Elkon Gallery and the Andre Emmerich Gallery. 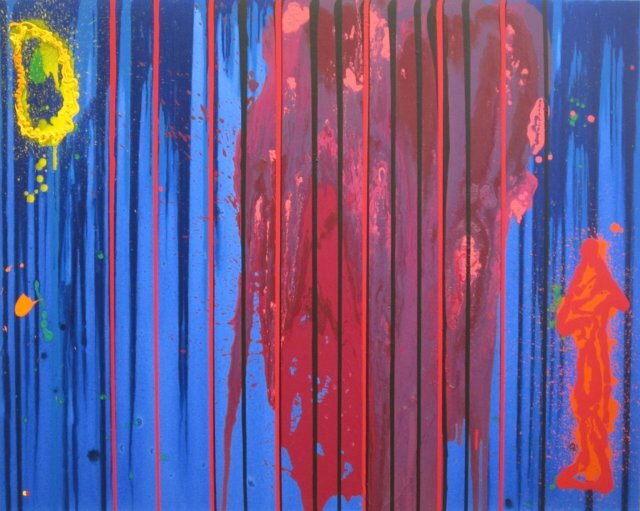 His paintings are closely aligned with Post-Painterly Abstraction, Color Field painting and Lyrical Abstraction. Retrospectives of his paintings have been held at the Serpentine Gallery (1979), the Royal Academy (1999) and Tate St Ives (2006).He won the 1982 John Moores Painting Prize. His works are held in many public and private collections including the Tate. In September 2010, Hoyland and five other British artists including Howard Hodgkin, John Walker, Ian Stephenson, Patrick Caulfield and R.B. Kitaj were included in an exhibition entitled The Independent Eye: Contemporary British Art From the Collection of Samuel and Gabrielle Lurie, at the Yale Center for British Art.